Harry Potter was my childhood. Ever since I’ve been trying to find that book that recreates that magic something that made that series so amazing. Sophie is a witch. After a magic disaster, she is sent to Hecate Hall, where she attends school together with fae, shifters and other witches. Something is draining the Hex Hall students of their blood, but why and who? The first thing that struck me is how Hex Hall was more juvenile than I was expecting. Lately I’ve only read older YA books and adult books, so getting into this very high-schooly mindset was hard for me at first. The writing is very easy going, and Hex Hall is a quick read. Although this book has more than three-hundred pages, I felt as if the page time could have been used so much better. The story failed to bring the magic world to life for me. The life at school is only sporadically touched upon, and there weren’t enough details for me to really get into it. Another problem I had was the lack of male characters in the story. The female characters are aplenty, and are all given a name and some kind of personality, but from reading the book you would only think there was one male student living at Hex Hall. I found this very unrealistic – even if you have a crush on a guy, that doesn’t mean you don’t see the other guys. I really liked the ideas Ms Hawkins had, and her world sounds interesting. 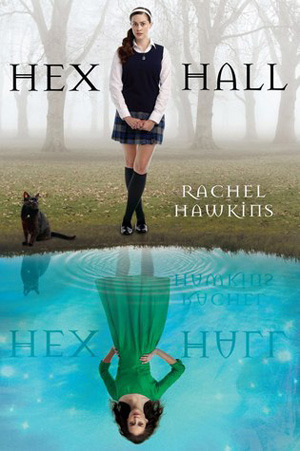 I’m intrigued enough to continue reading the other books, but Hex Hall overall felt very much as a debut.